Spring cleaning is done, the garage and shed have been cleaned out. Winter tools and clothes are put away. Now it’s time to tackle those boxes, bags and totes full of stuff you don’t know what to do with. It’s time for a rummage/garage/yard sale. What better way to make some extra money for your summer then to have a sale. Another great way to de-stress by letting go. It’s time to get rid of those boxes and make things feel fresh in your home. My mom and aunts are/were the garage sale queens. From buying at sales to having them. My mom has a sale every year. She has been doing this for over 30 years. She has regular customers that can’t wait to look for those good finds. Generally they find them at moms. My mom is great at setting a sale up. She has had many years of experience and has taught me how to do the same. Since I can remember I’ve have always helped. When I was old enough 8-9 years old, I was in charge of the money. She taught me how to make change. There’s a lost art in today’s world. She taught me and showed me everything she knows about having a garage/yard sale. Here are few helpful tips. Prepping: Having a sale takes time, lot of time. Make sure you have time set aside to do the following. Get your tables, hanging racks (these can be makeshift). You will need bags for you customer’s purchases. Newspapers to wrap breakables in. You will need a cash box or something secure to keep your money in. You will also need startup money to make change. Get your signs and make sure you have your permit to have a sale in town. Pricing: You will need to go through your items. Make sure items are clean, not dust or grime. Make sure everything works. If it doesn’t work either trash it or make a “FREE” box. You will be surprised how many people will take this stuff off your hands. Price every item and price it as if you are buying from someone else. Don’t price it high just because you paid a lot for it 15 years ago. Price your stuff to sell. The more you sell the more you make. Don’t price items as if they are on e-bay. This is not E-bay it’s your garage/yard. The intent is to make a little cash not for these things to go back into the house. Pricing has to be fair. If you’re not sure what price, ask a few friends. Look it up on E-bay and drop the price from what E-bay is selling it for. Be sensible. Setting up: Make each table a theme. Such as, glassware, nick-knack’s, boys’ clothes, electronics, tools or books. People like it organized as if they were in a store. If you have a clothing rack, separate by men/women. Make sure your shirts are on hangers. Most shoppers won’t purchase a shirt if it’s folded. Easier shopping this way. Set larger items up front so people driving by are intrigued. It’s an eye catcher. More people will stop and shop. Sales over: When you sale is done, it’s time to clean up. Hopefully you had a great sale and there’s not too much to clean up. If items didn’t sell this is the time to think about what you are going to do with the left-overs. For me, I had the sale to get things out of my house and to make some money. So, if it didn’t sell, I box it all up and donate the rest. This way I have made some money and others can benefit from the things I didn’t sell. It’s a win, win situation. If you don’t want to donate and you think you will have another sale in the future, you do have the option to put back into the house for storage till the next time. That is if you have room to store. The good part is you won’t have to price these items. One less step. If you know of a family member or friend that is going to have a sale soon you can always ask them if you can add your leftovers in their sale. These are just a few tips to help you get starting with a garage/yard sale. I hope they have helped. 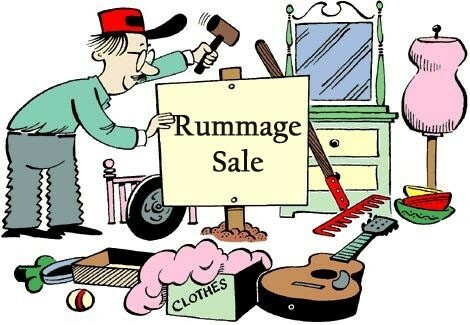 Categories: Helpful Tips, Rummage Sale | Tags: De-clutter, Extra cash, garage sale, Helpful tips, Organizing, Planning, questions answered, rummage sale, simple things, yard sale | Permalink.